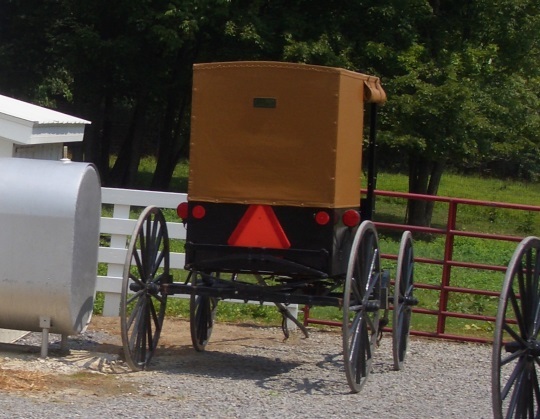 What color is an Amish buggy? If someone asked you that, what would your answer be? Odds are you’d first think either black or gray, the two most prevalent hues. But as you may know, those aren’t the only Amish buggy-top colors. Black is by far the most common buggy color. It’s used by Amish from many different affiliations–from the various groups in Holmes County, Ohio and northern Indiana, to those in Buchanan County, Iowa, to the Renno Amish of central Pennsylvania, to the Dover, Delaware churches, to the tiny Kokomo, Indiana affiliation. The same color doesn’t mean these buggies share the same design or shape, however. This becomes apparent when you compare, say, boxy Renno buggies with angly Indiana-style buggies or curvy Dover buggies. The familiar graphite hue is used by Lancaster County Amish and those of its sister settlements. The Lancaster churches comprise the largest Amish affiliation, of around 300 congregations in eight states. Why gray? The color has apparently evolved over time. Stephen Scott, author of Plain Buggies: Amish, Mennonite, and Brethren Horse-Drawn Transportation, writes that in 1860, Phoebe Earle Gibbons described the Lancaster buggy covering as “yellow oilcloth”. Benjamin Hoover, an Old Order Mennonite deacon born in 1874, states that the Amish buggies of his childhood “were about half yellow and half gray”. Another writer noted in 1911 that “the yellow of the oilcloth has disappeared, lead color having taken its place” (quotes from Plain Buggies, p. 51). Yellow tops have remained in one group, however, which we’ll see a little further down this list. You’ll find brown-topped buggies in the large community at New Wilmington, Pennsylvania, and its related settlements in Pennsylvania and New York. The color might also be called “burnt orange”, or “dark yellow-brown” as Stephen Scott describes it (p. 58). 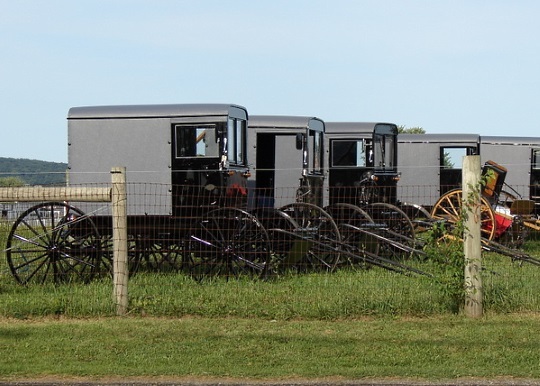 The Amish in New Wilmington originated from Mifflin County (Big Valley area) and are related to the Byler Amish of that community (they are even referred to as “Byler Amish” in some sources; see New York Amish), though their buggies are of a different hue. Why the odd color? As with a lot of Amish customs, the “whys” can be difficult to answer. In the Pennsylvania Amish Directory of the Lawrence County Settlement (2003), Eli J. Byler speculates that “this custom must have come from Mifflin Co. into Lawrence, and to all other settlements that originated from Lawrence Co” (p. 3). Stephen Scott has another suggestion: “This color approaches the color commonly seen on circus tents and perhaps the Amish obtained this same type of canvas for their tops many years ago” (Plain Buggies, p. 58). We don’t know for sure if that’s correct. But I like the irony of circus tent canvas possibly adorning buggies of one of the plainest Amish groups. 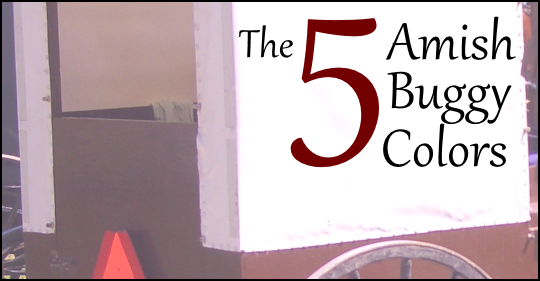 White buggies are used by the Nebraska Amish, numbering around 20 congregations in total. This conservative group is found in Pennsylvania (main settlement in Mifflin County), Ohio, and a fledgling community in New York state. If you find the name puzzling, the “Nebraska” tag comes from the home state of an early leader. These very plain buggies have no storm front (like the windshield on a car), so technically are only partially enclosed. Interestingly, Stephen Scott notes due to the mounting of the step plate on this buggy, it’s necessary to enter from the front rather than the side, “a feature that carriages of other Pennsylvania plain people had early in this century [20th]” (p. 55). Another interesting point: it is–or at least was–possible to see a white-topped buggy in a non-Nebraska settlement. The New Wilmington group apparently uses a buggy called a “peddle wagon”, with a white plywood top and black sliding door and box (photo on p. 59 of Plain Buggies). I’ve never noticed one on my visits to that community, but I’m assuming this is still something you can see among the New Wilmington people. 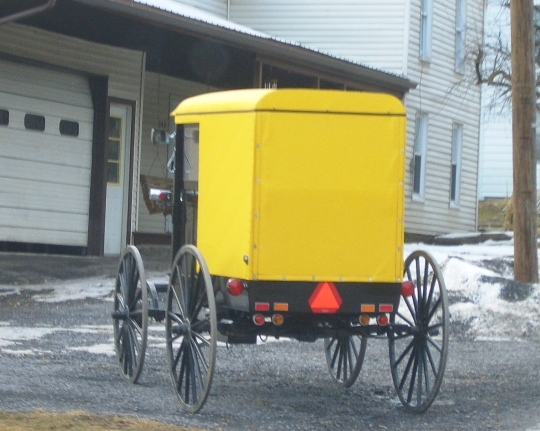 The most unlikely of Amish buggy colors, the striking lemon-topped vehicles of the Byler churches, mainly in Mifflin County, Pennsylvania’s Big Valley settlement, are hard to miss. This is the rarest of carriage hues, with only five church districts in this affiliation as of 2012 (see The Amish, p 139). Note: As reader Mark points out in the comments below, the single-district Enon Valley, PA church also uses a shade of yellow (though different from the Byler Amish top), described as a “pale yellow”. Where did the Byler Amish yellow come from? Stephen Scott shares two theories. One Amish person suggested that white paint on early carriages turned yellow, which eventually led to people simply painting the tops that shade. A second theory is that early tops were made from unbleached oilcloth–the same kind once used for raincoats–which had a pale yellow tone (Plain Buggies, p. 56). To be sure, this is an unforgettable color, and in a culture that values plainness, a little surprising to see. But it’s a custom that’s been around a long time. So there you have the five Amish buggy colors. There is of course a sixth buggy-top color, and that is “transparent” or “invisible”. That can be “seen” in the Swiss Amish churches, who for the most part use only open-top vehicles. I’m thinking the yellow buggies would be so much easier for drivers to see. However, I’m just looking at the safety factor. Thanks for sharing this info, Erik! It seems like they would be, doesn’t it Margaret? Stephen Scott writes that “the custom is very old and is certainly not an effort to be more visible on the highways as a measure of safety.” But it’s certainly an eye-catching color. I wonder if a study could be done on this group’s accident rate. yes so easy to see! Aren’t those basically a New Wilmington-esque shade? Eli J. Byler writes something about them in their directory, but it’s a little hard to follow his account. He writes about carriages in Enon Valley once being “kind of reddish brown”, and references a “light flat reddish color” but it’s confusing because he also talks about yellow top buggies in the same account. To make things more confusing, the title of his piece is actually “New Wilmington Amish Yellow Top Carriages” 🙂 He writes as if he considers the NW buggies, which I’m calling “brown” here, to be “yellow top” (unless I have undiagnosed color blindness, I have trouble seeing how they could be called yellow unless it was just a customary name that carried over). I don’t have a date on his piece but it appears in the 2003 directory. It looks to me there has been a color effect. The Enon Valley buggies are not the bright yellow of Big Valley Byler or Swarey carriages and not the brown on New Wilmington, but a pale yellow. It is different from the other two. Well, then maybe I need to throw it in “Yellow”, or add a new category, or maybe a 5a subcategory 🙂 This is interesting, I know Enon Valley is small, just a single district I believe, but quite old. It would be neat to know how this came to be…though given how these histories seem to be murky I don’t know how much is definitively knowable. I’d also like to ask a New Wilmington person sometime how they’d describe their own buggies, color-wise. Maybe my “brown” is in fact “yellow” to them, as Eli J. Byler seems to be suggesting in his piece (Here’s how it begins: “Why yellow tops? Where did it start from? The Byler Church in Mifflin uses yellow top carriages *too*” [emphasis mine]). One thing I noticed, the buggies in that Enon Valley photo actually look to be two different tones…not sure if that’s some camera effect as well, or because of lighting, some other cause, or if they’re simply just different tones. About half seem significantly darker than the others. For that matter, New Wilmington buggies I’ve seen have sometimes seemed to be different tones. Maybe that’s lighting, something with my eyes, or some are just older and faded. Maybe that’s part of the story. I did find an article which describes Enon Valley buggies as “yellow”, though it’s from 1981. Enon Valley started with people from yellow-top churches as well as white-top Nebraska Amish backgrounds and has customs or rules related to both. Maybe the pale yellow was a compromise between white & yellow tops? At one time (don’t know if it is still that way or not) Enon Valley buggies had either brown-painted boxes & running gears or black ones. That connects to the brown boxes of the Nebraska Amish. Like New Wilimington, Enon Valley allows storm-fronts in their carriages but only during the winter season. It occurred to me that I’d noticed differences in shades with Lancaster buggy tops too, but again wasn’t sure if that was just my eyes 🙂 I think I’ll slide this one in under “Yellow”, marked as a different shade. If anyone has a half-decent photo of the Enon Valley buggy, I would appreciate seeing it and possibly sharing it here (ewesner@gmail.com). Thanks Mark for the additional info. You don’t know if they have any daughter settlements where this buggy might be used? I know that some from Enon Valley helped settle Conewango Valley in NY, but there were also Holmes Co. people in the mix and I think the ones there are black buggies. On boxes and running gears, Eli J. Byler writes “The Amish in Enon Valley, PA still have their carriage box and gears kind of brown color, not black. Except the open buggies were black.” There’s no date attached to this piece, but it appears at the front of their 2003 directory, so it may be that he wrote it especially for this directory (or could have been recycled from a previous edition or some other source). But if it’s 2003 then it would seem that they still had that color box and running gear at least recently. I assume the piece is recycled because a relative in Enon Valley was the one to tell me that some now have black running gears & boxes. I don’t know of any communities like Enon Valley but do know a lot of people moved out of Enon Valley & moved to Turbotville or Washingtonville PA. When in Lancaster County, PA and St. Mary’s County, MD you will also notice black buggies. I’ve listened in on tourists’ comments and they think these are also Amish. The Lancaster Mennonites I’ve seen are around the Ephrata area. The St. Mary’s Mennonites are in the more southern part of the county as the St. Mary’s Amish in the more northern part. If someone knows (which I’ll bet they will), what is the evolution of the carriage/buggy-types in Belle Center, OH and Hardin Co/DeGraff (the last two I think are the same), OH? Where did the carriage styles originate before the families migrated to those locations? Do any Old Order or New Order Amish wheels have rubber tires that anyone knows of? Thanks! New Order generally use rubber. I don’t *think* any Old Order in Holmes County permit this, though with so many churches there may be some that do. Mark of course would know better than I. An Old Order minister friend of mine commented on this once, sort of wondering why his church couldn’t have them. In An Amish Paradox (2010) the authors state that the Old Order do not use rubber, though there is something called “rubber buffers” lying underneath the outer layer of steel which is apparently acceptable. Also in An Amish Paradox there’s a nice quote on this, which could also be used to explain other situations where one group has something and another doesn’t: “A more probable explanation was offered by one Amish man: “The only reason the Old Order don’t have rubber wheels is because the New Order did it first.” Whether something is adopted or not may depend at least in part on whether another group, perceived as “higher” or “lower”, has done so first. The authors also make a point that even though the OO don’t have rubber, they have accepted quite a few technologies that are much more progressive than that. Some Old Order have technologies that New Order churches don’t allow. I do not know of any Old Order districts here that allow rubber tires, but the rubber “buffer” is becoming more common. I think many people would be okay with having rubber, but so far it has not been allowed. The idea it is because the New Order did it first makes sense. Same for sliding doors — a lot of the churches we are connected to in other areas have rubber tires & sliding doors or curtains, but we do not. Many of the Belle Center people have their roots in Holmes Co. and as far as I know their buggies are similar if not identical to New Order buggies here in Holmes Co. I could be wrong about this (and do not have the time right now to check it out) but it seems to me I had heard Hardin Co. was originally settled by people from the LaGrange, Ind., community who were hoping to escape more liberal trends there. Again, i could be wrong. I have never been there, but from what I have seen on here I think their buggies are similar to those used to Stockport, OH. I know they are not the same shape as LaGrange, and I have no idea why. Hopefully someone else knows more about it. Thank you, Erik and Mark, for your help with my questions on a few buggy types. It’s appreciated! Some of the Belle Center Amish came from Plain City, Ohio, which came from Holmes county starting in 1896. Erik, I don’t know if you were intending to limit you discussion to the full-size family-hauling sedans in the Amish buggy world, but there are some clear covers I’ve seen used in some of the pony carts (coupe?). Below is a link to one I saw in Kalona, IA. I’ve seen another one — I think somewhere in MO — but I don’t recall off the top of my head where. Thanks for sharing this Don. I remember this–I guess it’s another “invisible” option, I don’t know if it gets its own category or gets lumped in with #6, or what 🙂 Very interesting, and seems quite practical for these two-wheelers. I think we’ve already seen some parked examples of these clear-topped vehicles in the set of Don’s pictures you posted on 19th March 2014. On the subject of the Byler Amish, I’m assuming that their bright yellow buggy tops are a relatively new development, and that the orange-brown tops of New Wilmington and its daughter settlements were the original Byler tradition. Erik, it took some digging, but I finally found the other example of the clear top buggy in some not-yet-posted pictures. I suppose you would call this the sports convertible model. Does anyone know why the Ordnung of the Allen/Adams County Amish requires the open buggy? I can understand why it would be required in a courting buggy (no hanky-panky) but not for family travel. I’m guessing it is just tradition. 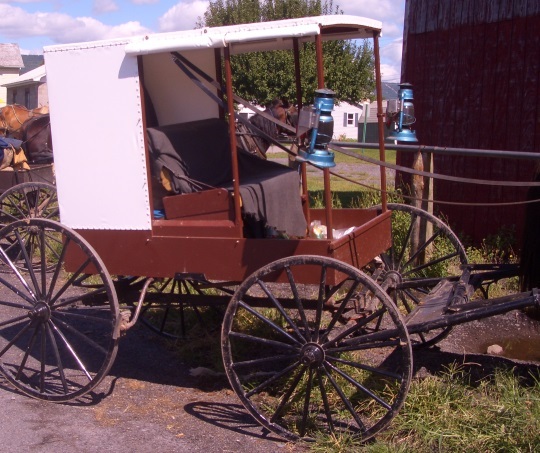 Long ago, covered or top-buggies were rare in the midwestern Amish communities. When tops started becoming accepted, Swiss Amish communities did not accept them. Thanks, Mark. That makes perfect sense. I just always feel so sorry for the families in this extreme cold. I know what you mean, Harriet. Though we have top-buggies, we still use our open hack sometimes in the winter. If you dress warmly, it helps a lot, and most have either an oilcloth covered lap robe or an oilcloth that snaps to the box and can be drawn up to help cover the people and break the wind, keep rain off, or whatever. I would rather have an open buggy and a good strong buggy umbrella than a top-buggy with no front. I’d think the white covered buggies would be cooler in hot, sunny weather—if only a little. But about those buggies with no storm front—doesn’t it make them harder for horses to pull, almost acting like a parachute “drag” on the back of the space shuttle or race cars? Just wondering. A buggy with no storm front does scoop the wind more, but if you look at an open-front buggy traveling, you might notice the back curtain is puffed out. Some of the “wind” will blow out between the snaps in the back curtain. Since a horse does not travel that fast, it is mostly noticed when it is traveling straight into the wind. This reminds me…a friend is searching for a catalog from a carriage shop in the Lancaster area. I cannot seem to recall the name of the shop but I suspect they are the largest outfit in the Lancaster area. At least they have the fanciest catalogs. They sell various buggy parts to both wholesalers and consumers, as well as paint (just black, as far as I am aware). Rumor has it that this shop has the best paint around. Would anyone happen to be able to put a name to this question? And perhaps even an address and telephone number? Jonathan maybe someone else knows, I can name some shops but don’t know them well enough to say anything about paint. You might also try checking the Lancaster County Business Directory (maybe you already have), which conveniently is also available online. I don’t know if it will have the specific info you need but will at least give you a number of carriage shops and their contact info to consider. Just searching “Carriage” I noticed one which mentions “paint jobs” prominently in the ad (Fairview Coach Shop in the Lititz area), fwiw. Thanks a lot, Erik. I was able to find it in that publication. I looked elsewhere in what was something like a ‘Lancaster Business Directory’ but you link was to the real-deal Lancaster business directory. Glad if it helped Jonathan. It’s nice that that big book is available online. They also give the hard copies away in many shops in the area. When traveling in Amish country and the roads are hilly I always slow as I near the top of a hill. To often I’ve crested a hill at full speed only to find a buggy just over the top that was unseen. If on coming traffic is present there is no option than slamming on the brakes. This, I’ve found can really scare the horse and driver. Ice never had an impact with a buggy buy I’ve come really close (inches). Live and learn. I live in an Amish community in Indiana (I’m not Amish) where the buggy is all decorated with red, green, blue and yellow lights on sides, back and front and even underneath. Quite colorful and easy to see! This is near Fort Wayne, IN. 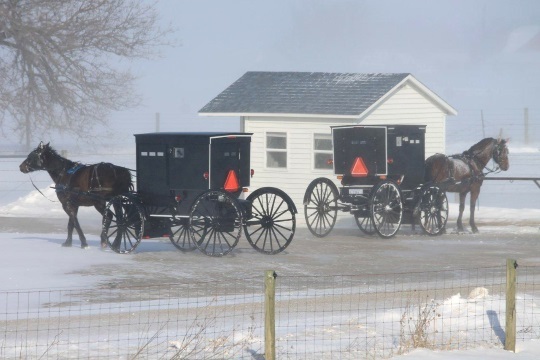 Amish can be found on roads including 600N, 500E, 600E, 700E in the Kokomo area. I’ve never visited the community but there might be others here who can give you better suggestions, eg business locations. Monica those are “market wagons.” Originally they were used for peddling or going to market. A family might have the usual brown-topped buggies and still have a “market wagon” stored away, but they are not that common.